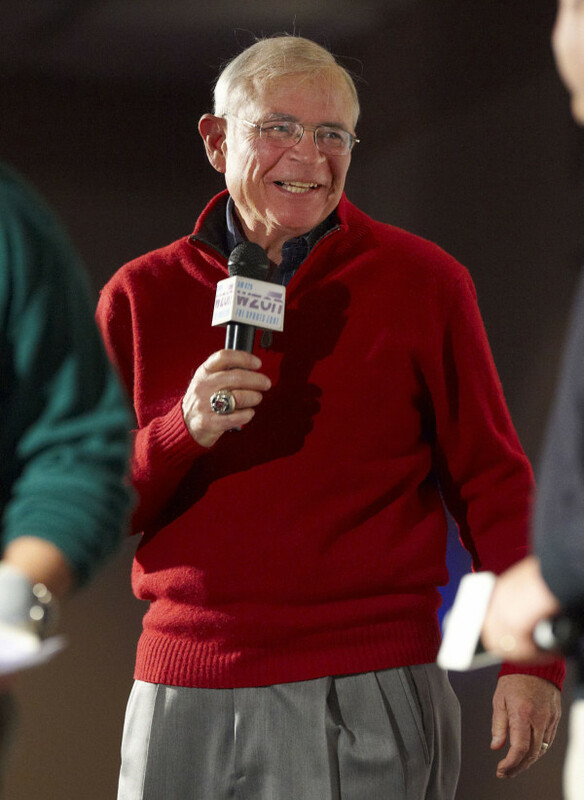 Voice of the Boston Red Sox Joe Castiglione at the Bangor Civic Center, Monday, Jan. 25, 2010. Jim Talbott is a baseball fan and grew up supporting the Philadelphia Phillies. He knows how popular the Boston Red Sox are in Maine, but the owner of radio station WSYY, 94.9 FM, in Millinocket had to pull the plug on carrying the Red Sox games. “It’s just too expensive. We lost a lot of money on it last year,” he said. But Talbott doesn’t blame WEEI, the Boston station that broadcasts the games and charges rights fees from stations wanting to broadcast their feeds. “I don’t have a problem with [WEEI]. They’re very nice. They’re trying to make money, too,” said Talbott. Talbott said it is simply a matter of the economic decline of the region after the closing of the paper mills in Millinocket and East Millinocket, he said. “And we don’t make enough money to do it as a community service,” he said. Local business owners don’t have the money to sponsor the broadcasts. He would not divulge the right fees, but it was believed to be in the vicinity of $8,000 per year. Talbott said he would re-evaluate the situation in the future and see if they can bring it back if it makes financial sense. Bobby Russell, the general manager of Bangor’s Zone Corporation, which airs the Red Sox on WZON, 620 AM, said the rights fees for the Red Sox dramatically increased after they won their first World Series in 86 years in 2004. Russell said although it is “very pricey,” it is a money-maker for the station because they are able to attract enough sponsors for the games, which feature longtime Red Sox broadcaster Joe Castiglione. They have several longtime sponsors in addition to new sponsors. “But [sponsorship] isn’t sold out. We’re looking for more,” said Russell. Russell said the station has several ventures that have helped make the Red Sox an “adequate” money-maker like bus trips to Fenway Park and contests that give listeners the opportunity to win Zone Corporation owner Stephen King’s box seats for a game. The seats are located near the Red Sox dugout. King also owns a small share of the Red Sox. Sponsors are awarded access to season tickets owned by the station. “And sponsors can have in-house promotions involving season tickets,” said Russell. He wouldn’t disclose their rights fees but said it is well over $10,000.